Hospital Fleece Wool Chair Pad: 18" x 36"
This Pure New Wool Wheelchair Seat Pad is made from Merino Lambswool with a very high pile density -1050 grams per square metre (GSM )- covers the seat and back of most wheelchairs. An elastic strap holds the Pad to the back of the wheelchair. Wool Technology by MiniJumbuk in Australia has developed a new range of pure wool products of exceptional quality. The Hospital Wool Fleece has to be seen and felt to be believed. This MiniJumbuk product looks like and feels like our Medical Sheepskins.The very dense 1050 GSM Merino Wool offers excellent pressure reduction and moisture absorption..major causes of pressure sores. This Merino Wool Pad is made from 100% pure new wool. The Hospital Wool Fleece was created specifically for medical applications that required a more dense, non-linting, highly absorbant fabric. In a study done in the Infection Control Unit of the Sydney Adventist Hospital, nurses were very enthusiastic about the performance of the Hospital Wool Fleece. Comments from nurses included increased patient comfort, reduction of pressure points and the alleviation of sweat rashes and itching. They agreed that Hospital Wool Fleece was clearly superior to the synthetic pads that they had been using. 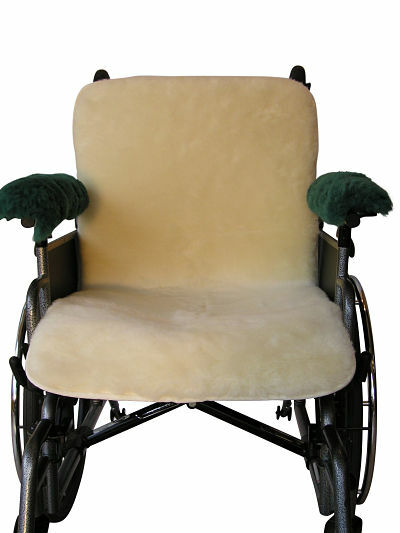 The Hospital Wool Fleece Wheelchair Pad ( 18" X 36" ) Ideal for incontinent users because it is Machine washable and Machine dryable, making it an easy care product. Use a "blue pad" underneath to protect the mattress. Wool will absorb an amount of water up to 33% of the weight of the wool, without feeling wet. This moisture is wicked away, keeping the user dry and comfortable. The Hospital Wool Fleece offers excellent pressure reduction and improved comfort.